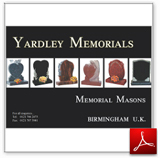 We offer a wide range of memorials to choose from. Granite for example is a durable stone that will retain its beauty without fear of significant weathering or deterioration and is available in many colours. Please review the charts below and choose your colour. We pride ourselves on personal service and customer care. So if you have any queries not answered by the web-site, then please give us a call or drop us an email.